It was the perfect storm of reasons that pushed me to toe this line. For one, despite discovering my newfound love for half marathons, I still hold a warm place in my heart (even when the weather is not) for the 5K distance from my days of high school cross country. And, although I am not nearly as fast now as I was then, I maintain that the 5K offers the best experience for getting that unique community feel. I had also signed up to run the Hall of Fame Half Marathon the following day. Seeing as I would need to do a shakeout run for that on this day anyway, I might as well pick up a SMO for doing it. Yes, you read that correctly. An SMO for a 5K!—and what a SMO it was. But we’ll get to that in a minute. Getting to the race was simple, as Canton is a little over an hour away from my home in Youngstown. For an 8a.m. start time, however, that meant waking up at five in the morning…I must be crazy about running to ever see this time of day. Those footballs look a little deflated. So maybe that should be a Patriots jersey? Two participants bear special mention because of excellent race day outfits and performances. 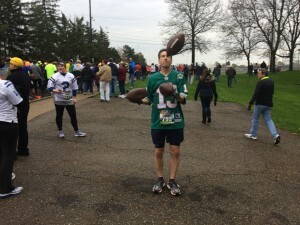 The first is a runner wearing a Dan Marino jersey who juggled three footballs for the entire race. Saturday was the quintessential April morning in Northeast Ohio: high thirties to low forties—not quite freezing, but not warm in any sense of the word either—and threatening to rain throughout. Given the fact that I could expect any number of possible weather combinations, I split the difference in dressing. No sweatpants, but I did wear an Under Armour shirt, a rain jacket, and a Notre Dame Law School winter cap (that eventually made its way into a pocket). The expo for the 5K is the same as the half marathon and marathon events (more on that in our half marathon event coverage). For those who did not make it town on Friday, the race organizers opened up McKinley Field House at 6 a.m. for participants to come in and pick up their numbers. In addition to the number, each runner picked up their free race shirt. The whole process was quick and easy. My race buddy and I arrived about an hour ahead of the gun going off. After we signed up, we ran our swag back to the car and huddled up inside the field house to stay warm. Eventually, the race directors called us outside for a rendition of the national anthem, a quick pep talk from Dan Marino (yes, THE Dan Marino), a discussion of the Hall of Fame Gold Jacket Race Series, and then we were off! This course was designed to be lightening quick, but then again, that is to be expected for a course that is almost entirely downhill from start to finish. Aside from the congestion in starting area resulting from the mass start, the race ran pretty smoothly. People’s natural pacing eventually solved the congestion issue naturally as we headed downhill. My mid-run selfie with this guy was too busy fighting the “Winter Soldier” to stop the “winter season” from creeping back into Ohio in late April! 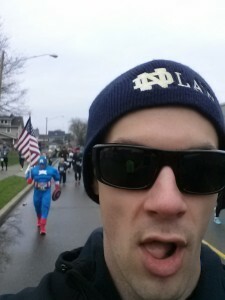 The second runner who bears mentioning is a guy who sported a Captain America outfit, complete with muscle padding, and carrying the American flag, who quickly became a favorite of his fellow Casual Runners. In terms of gauging the speed of the field, I had positioned myself about halfway through the pack at the starting line, as my race plan was to use this race as the shakeout for the half marathon. With more of a cool-down pace in mind, I found myself roughly in the middle of the pack. Even though this isn’t the most scientific estimate, I think that the race was attended by both newer and more experienced runners. Therefore, anyone interested in this race shouldn’t not run due to speed concerns (either that it will be too competitive or that it will run too slowly), as it welcomes Casual Runners of all types. 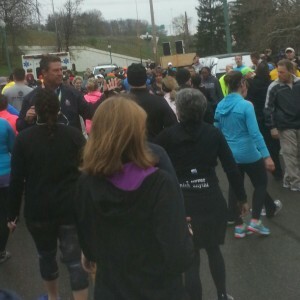 For the first mile, the course ran along residential roads, overlooking a highway. Race Icon: The second mile featured a turn into more residential areas, with a nice there and back in front of the William McKinley Memorial (see the featured image at the top). The conclusion of the race followed a nice path along a river through Stadium Park before concluding at the foot of the hill on which Fawcett Stadium and the Pro Football Hall of Fame sat (emphasis on foot of the hill; excellent decision in this author’s humble opinion). This finisher’s medal is awesome. Just look at this thing. The SMO for completing the Gold Jacket 5K, sitting atop the event shirt. Did I mention that this was the award for completing the 5K? It is designed to look like a Hall of Fame inductee’s ring (yet another tie in with the Pro Football Hall of Fame), and has serious weight to it. My best estimate is that it weighs more than one of my running shoes, and takes up the area of an apple. This thing is unbelievable. It may well be my new favorite SMO. This race had one of the best immediate post-race experiences I have ever experienced. Immediately after crossing the finish line, I and my fellow race entrants were greeted to a high five from Dan Marino. Then again, I should not have been surprised to briefly chill with a Gold Jacket at the Gold Jacket 5K. 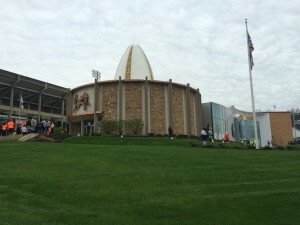 It’s a neat little tie-in to the Hall of Fame, and something unique that Canton can offer. One thing is for sure, it’s not every 5K where you get the chance to meet a celebrity. Props to the race coordinators for putting together an excellent post-race experience. Dan Marino congratulating those who braved the morning to complete the Gold Jacket 5K. Shortly after the high five with Dan Marino, we made our way to pick up some light snacks (bananas, energy bar, and water) and headed over to the Expo for the Half and Full Marathon (more on that tomorrow). I did not go with a playlist this time around because of the race distance. Even using the race as a shakeout for the half marathon did not add enough time to the run to justify using an iPod in my mind. Plus, I had some company with me for along the run who would also be joining me for the half marathon the next day, so we occupied the time discussing our race plan for that race. By the time we had figured that out, the race was almost over (true story: just as we began to wonder if we had passed the two and a half mile marker, we had snuck up on the finishing chute!). The race just seemed to fly by. 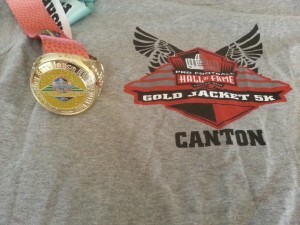 The Gold Jacket 5K definitely delivered in its inaugural year. The course finished (thankfully) at the bottom of the hill leading up the Pro Football Hall of Fame. The course was easy on the legs, the weather cooperated just enough, and there were a number of exciting extras (An amazing finisher medal, high fiving a Hall of Famer) that separates the race from other 5Ks that I have done. While my decision to do this race came pretty close to the last minute, it was a decision that I am most certainly glad I made, and I will definitely be making sure that next year’s race is on my calendar. We will have more coverage of the Hall of Fame Marathon weekend with our review of the 2015 Hall of Fame Half Marathon. You can check out our YouTube video of all of the excitement of the weekend’s events.